Here are some examples of what GDS can do for you. Garage Door Solutions takes special care to understand the unique needs of each of our clients to design custom solutions that exceed expectations. 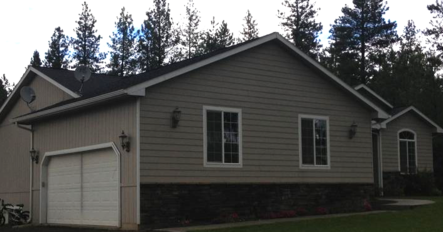 New garage doors dramatically elevate a home's curb appeal for minimal cost. We are proud of the work we do and would like to share some of our past privileges along with some of our reviews. Garage Door Solutions did a fantastic job installing our new garage door. Very professional attitude, quick install and all at a great price. I'll be calling GDS for any future garage door needs. Thanks again! This door rollers up inside the roof. Here at Garage Door Solutions no job is ever to big. Our original garage door was installed when the house was built in 1962. James and his crew did a fantastic job removing the old door and hardware with minimal mess or hassle. The new door and opener were installed in a few hours but their customer service and follow-up really separate them from the rest of the competition. Without reservation, I would recommend James and GDS to anyone interested in making a sound and hassle free investment in their home. MARK L.
James, of Garage Door Solutions, presents himself and the business with honesty, integrity, promptness, and expert experience. James will leave the premises only when he knows I and Benita are satisfied with his workmanship. We have found James very congenial to our wishes and it is great to find a business in the Spokane area which sincerely puts their customer satisfaction first. We strongly recommend GDS for anyone needing professional garage door repair or replacement. Thank you James. Bob P.
*** and **** were delighted at the service they received from James at Garage Door Solutions. As a business owner, my reputation is on the line when I refer out service providers, and when I hear praise from my customers about James service it improves my relationship with them as well. Great Job James, thanks for the good work! Kirk G.
Had an great experience. Got an appointment immediately. Within 24 hours of initial inspection I had a brand new garage door installed. Technician told me exactly what I needed and more importantly what I didn't need. Didn't try to oversell and let me know I could insulate the door later if I wanted. I wasn't even home for the install. They showed up and were gone within a few hours. Very impressed. Thanks!!! Annette K.
I had been referred to Garage Door Solutions by a friend; he simply said, "They're the best!" Well, now that I've had the privilege of having them install a new garage door and opener, I can readily agree. They truly are the best! From the very onset in the estimate process, I was impressed. They walked me through the options that fit my budget and complimented my home perfectly! They were always so good at communicating and keeping me in the loop. And, when it came time to install the door, I was once again very impressed. They actually showed up on time! These guys are professionally dressed and their conduct exemplifies excellence. I have absolutely no reservation at all in HIGHLY recommending Garage Door Solutions to any and all of my friends! If only there were more businesses that operated with such integrity and craftsmanship!